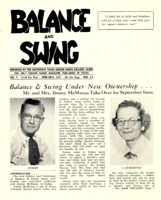 Balance and Swing was a square dance magazine published in Dallas, Texas and edited by Swede Söderberg. With Vol. V, June-July, 1957, Jimmy and Catherine McManus took over the new ownership.